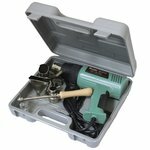 A heat gun is used for soldering low-melting materials, removing paint and warming the workpieces. This tool is composed out of a spiral that is heating the air, and an electric motor that blows air out of it. 28 mm diameter nozzle. Working temperature set at 380°C. Double insulation and impact resistant heating element and 5 accessories. 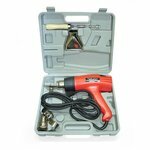 This heat gun is used in different areas.